Llama Bob grew up on the rocky cliffs of the Andes with an electric guitar and dream: to be the first llama rock star in the history of South America. 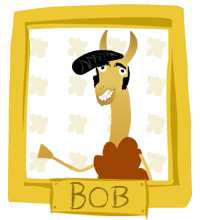 Bob quickly found a group of talented llamas to work with and started making music in a mountain-top garage. Bob got his big break when Ron “the Camel” Goldstein, hollywood agent and camel, overheard the group rehearsing while visiting a rehab facility. Ron quickly contacted the group and moved them to Machu Picchu, the center of the music industry. After several facelifts and weeks of singing lessons, Llama Bob and his band of llamas were ready for the big time. The Machu Picchu All-Stars were born, and released their first single - "Hey Little Darling", which has been number 39 on the Latin Mammal charts for about 73 weeks. Llama Bob is close personal friends with Barack Ollama.